The Dodger Dog is a hot dog named after the Major League Baseball franchise that sells them (the Los Angeles Dodgers). It is a 10 inch ballpark frankfurter wrapped in a steamed bun. The hot dog is sold at Dodger Stadium located in Los Angeles, California. 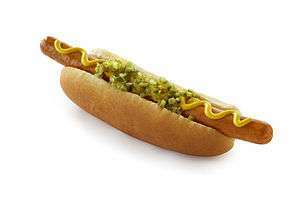 According to the National Hot Dog and Sausage Council, the projected number of 2011 season hot dogs sold at Dodger Stadium was 2 million—establishing Farmer John Dodger Dogs as the leader in hot dog sales of all those sold in Major League Baseball ballparks. There are two lines for Dodger Dog vendors: steamed or grilled. The vendors of the grilled dogs are typically located near the back wall of the stadium so that the smoke doesn't overwhelm the baseball fans. The grilled Dogs are considered the "classic" version. The success of the Dodger Dog has spawned a small chain of restaurants in the Southern California area. One such restaurant named Dodger Dogs can be found in Universal City, California. The Dodger Dog is also available in the “Super Dodger Dog” variation, which is made of 100% beef as opposed to a beef/pork blend. It is believed that Dodger Dogs were first called "Dodger Dogs" in 1958 when the Dodgers first came to Los Angeles from Brooklyn. Dodger Dog weiners are also sold to the public in Southern California supermarkets under the Farmer John brand. In 2011, the Dodgers introduced a Mexican-themed "Doyer Dog" which are made with chili, salsa, and jalepeños and condiments replacing the standard ketchup and mustard on your typical hotdog. The Dodger Dog is also served at Chickasaw Bricktown Ballpark in Oklahoma City, OK, the home of the Dodgers AAA affiliate Oklahoma City Dodgers. A concession area called the "Dog Pound" serves hot dogs from stadiums around the country including the Fenway Frank, Cincinnati Cheese Coney, Milwaukee Brat, and The Red Hot Chicago Dog. The Dodger Dog was not, however, served at the Dodgers' spring training ballpark, Camelback Ranch, during the team's first spring training at the park. This was changed for the 2010 Spring Training season where the Dodger Dog was either cooked on a hot dog roller or steamed. Thomas Arthur created the "Dodger Dog" during his 29 years (1962–1991) as the food concessions manager at Dodger Stadium. The 10-inch frank was originally made by the Morrell Meat Company, but Farmer John, one of the Dodgers' chief sponsors, soon took over the frank needs of the stadium. Farmer John was purchased by Hormel in 2004. Agent Mulder on The X-Files claimed that Dodger Dogs gave him "swamp gas". In Hancock, Jason Bateman's character, Ray, compares Hancock (Will Smith) to a Dodger Dog, saying "It's something people don't think they're gonna like, but then they try it, and they love it!" In The Sandlot, all of the kids on the team make fun of Scott Smalls (Tom Guiry) by calling him a L-7 weenie, a footlong, a Dodger Dog, a weenie. Johnny Drama on Entourage complains that Vince making him late won't let him get a Dodger Dog. ↑ Steve Lowery (2009-10-16). "Los Angeles fans speak frankly". Philadelphia Daily News. ↑ Elaine Woo (2006-06-27). "Thomas G. Arthur, 84; Made Dodger Dogs a Staple of L.A. Stadium Experience". Los Angeles Times.